Simon Warner’s Theatrical Tours go down a treat! Simon Warner is a Yorkshire based photographer and performance artist. Simon will be conducting unique walking tours of Harewood’s medieval history enhanced with an audio experience, a real experience of Medieval Harewood! Theatrical Tour dates: 17th July, 1st August, 14th August & 3rd September. There’s still time to book for Simon’s last Theatrical Tour on 3rd September, book now to avoid disappointment! Posted 15 August 2012 at 10.34am by Hospitality Team. Filed under: Notes. Tagged: explore harewood, medieval harewood, visit harewood, walks booklet. A Yorkshire Rose for Yorkshire Day! The Yorkshire Post were here at Harewood today to photogrpah a new rose named ‘Yorkshire Princess’ in honour of HRH Princess Mary. 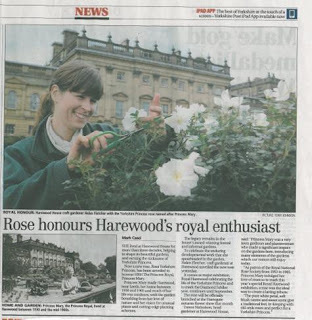 Our Craft Gardener Helen Fletcher is shown with the rose in the Yorkshire Post piece. We are introducing the new rose called ‘Yorkshire Princess’, dedicated to HRH the Princess Mary, Princess Royal, who lived here at Harewood for more than 30 years, to coincide with our Royal Harewood exhibition in this Diamond Jubilee year, . Resembling an old-fashioned rose, this beautiful, but modest groundcover or patio rose, has a slight sweet scent, and is white with a delicate Orient Pink centre. Flowering throughout the summer, it is suitable for planting in rockeries, at the front of borders or alongside paths in cottage gardens, and will shortly be planted here at Harewood to commemorate the Princess’s contribution to the Gardens. A limited number of Rosa ‘Yorkshire Princess’ will be available to purchase as a containerised shrub from the Harewood plant stall this summer, with new stock arriving in November 2013. You can register your interest by emailing us your contact details, and we’ll send you an update when further stock becomes available. Bred in Northern Ireland by Dickson Nurseries, it is currently available to pre-order online as a root for potting from their website for delivery in November 2012. We’ll be officially launching our new rose at the Harrogate Autumn Flower Show, staged at the Great Yorkshire Showground from 14-16 September, you can call the Ticket hotline on 01423 546157 or visit their website for more details of the show. Our exhibition, Royal Harewood, celebrating the life of the Princess continues until the end of September. Rosa ‘Yorkshire Princess’ – parentage Nice ‘n’ Easy x Regensberg; breeder Colin Dickson, Dickson Nurseries, Co Down; patio/groundcover; hybridised in 2005; blooms in clusters, white with hint of Orient pink; slight sweet scent; height 66cm, spread 65cm; flowers continuously throughout the summer. Posted 1 August 2012 at 11.36am by Hospitality Team. Filed under: News. 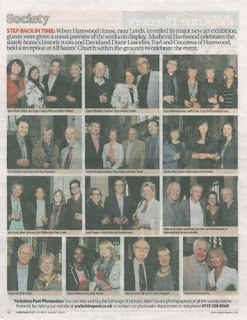 Tagged: Princess Royal, royal harewood, visit harewood, Visit the Gardens, Yorkshire, yorkshire post, yorkshire princess. The evening began with a tour of the Castle, followed by a Pimms reception in the Church to celebrate the completeion of the development project funded by the Heritage Lottery Fund and the Churches Conservation Trust. New works by artists Susan Collins and Eleanor Moreton were on display. The Church is a hub for Medieval Harewood with the new ‘Medieval Harewood Information Point’ located in the Church Vestry, and guests were keen to explore inside this hidden gem of a building! Guests were then able to view the exhibitions in the House, with the Terrace Gallery playing host to an exhibition of finds from the recent Gawthorpe Hall excavation, as well as new works by artist Diane Howse. The Gawthorpe excavation itself was open to view, and guests were treated to a hog roast and medieval-style entertainments on the Terrace overlooking the Gawthorpe Dig Site. This season’s exhibitions can be found in the church, throughout the grounds and in the Terrace Gallery. performance tours, moving image, paintings and photography bring stories alive to evoke Harewood’s fascinating medieval past. In the Terrace Gallery you can also learn more about the newly excavated Gawthorpe Hall. 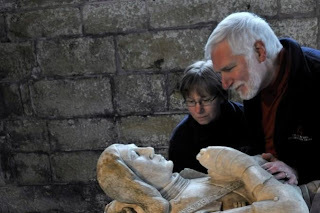 Diane Howse has responded to Medieval Harewood by photographing and digitally reconstructing the alabaster tombs of Harewood Church. The tombs would have originally been painted in full colour, and if you look closely at the effigies in the church, traces of original pigment can still be seen today. Diane has digitally recreated the colours that may have been used and her photographs give us a visual impression of the human beings that lived at Harewood. Simon Warner is a Yorkshire based photographer and performance artist. 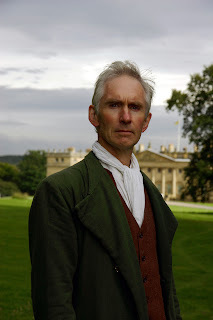 Simon will be conducting theatrical walking tours of Harewood’s medieval history enhanced with an audio experience. Tours will take place on Tues 17th July, Weds 1st August, Tues 14th August & Mon 3rd September. Places must be pre-booked by phone, visit our event pages for details…. Susan Collins is a film artist and is currently director of the Slade school of Fine Art, UCL. Susan has created a video intervention in the church as well as a moving photograph that can be viewed in full online. It can also be streamed on your smartphone to be viewed while experiencing Medieval Harewood. Eleanor Moreton has been inspired by the history of sisters Elizabeth and Sibyl de Aldeburgh who became joint heiresses of Harewood Castle in 1388. Her paintings respond to the relationships and power structures between families at Harewood in the medieval period as well as the illuminated prayer books, the Books of Hours, people owned at that time. Images courtesy of the artists, and Ceri Hand Gallery for Eleanor Moreton. Medieval Harewood is an on-going project to explore Harewood’s medieval history before the present Harewood House was built. Join us on this journey of discovery as we peel back the layers of history, where a few short miles can cover several hundred years. Look out for details of next year’s Harewood Medieval Faire which is scheduled for late May Bank Holiday 2013! Posted 20 July 2012 at 12.27pm by Hospitality Team. Filed under: News. Tagged: Exhibitions at Harewood, Leeds, medieval faire, medieval harewood, visit harewood, Yorkshire. With its fresh make-over, new stock and designer interior, the shop isn’t about padded hangers and lavender bags. Good on the eye, key brands are cleverly combined with local designers to give the shop a mix of must haves. Gorgeous items include leading young artist Donna Wilson’s quirky creature furnishings, high quality meats farmed on the Harewood grounds, Sheffield based David Mellor’s exclusive tableware collection, sweet treats from Art of Mallows and Dixie Kitchen, and wine and beers, including Harewood’s very own Harewood Gold created from its home grown hops. Lynne has a schedule of shopping events in the planning, with the first on 6th September with the Summer Night Market at the Courtyard, which includes live music, barbeque, wine and beer tastings, vintage clothing and loads more retail heaven. 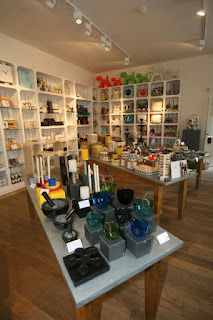 The refreshed and re-stocked Courtyard Shop is open 10am to 5.30pm 7 days a week and sells designer house and food items, much sourced locally for the freshest and the very best, and table and giftware items from the UK’s favourite designers and manufacturers, some of whom rarely supply outside of London. Call in on your next visit! Posted 19 July 2012 at 11.47am by Hospitality Team. Filed under: News. Tagged: Courtyard, Harewood, House, Leeds, Shop, visit harewood, Yorkshire. Mike Schafer, Chief Executive of Harewood House, announced today that The Box Tree Restaurant will head up Harewood’s ‘Fine Dining in the House’. Rena and Simon Gueller, who own and manage Box Tree Events were welcomed by David Lascelles, the Earl of Harewood and Mike Schafer, on the State Floor of Harewood House where they will provide a variety of fine dining options for private and corporate clients. Menus for Harewood will be created by Simon Gueller of The Box Tree Restaurant, one of the country’s leading chefs and a Michelin Star winner for an unprecedented 8 consecutive years. Simon’s menus for Harewood will combine French classics with modern English served within the grandeur of the State Floor, the unique Below Stairs and on the Terrace overlooking some of the finest views in Yorkshire. Posted 19 July 2012 at 10.26am by Hospitality Team. Filed under: Notes. Tagged: box tree at Harewood, dining in the Gallery, fine dining, Fine Dining at Harewood, State Dining Room.